Pete’s work as a teacher has always been a part of his journey as a musician – always moving in tandem with his performing and writing career. His reputation for clarity is well known and his deep understanding of his subject is matched only by his ability to communicate its essence at all levels. 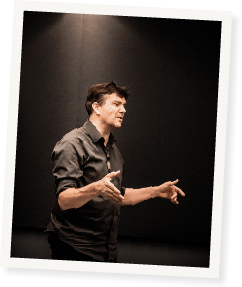 It was during his eighteen years of teaching on the Post Grad Jazz course at the Guildhall School of Music and Drama that Pete developed his legendary harmony classes. Rejecting the accepted approach to Jazz harmony teaching, Pete found more practical and lucid ways of leading students through the various harmonic pathways that they might take in their varied careers as improvisers. Now in his post as Head of Jazz Composition at the Royal Academy of Music in London, Pete’s breadth of vision underpins a truly forward looking Composition and Arranging department where every student is furnished with a clear set of skills that are relevant to their needs. He has developed a truly European slant to Jazz harmony teaching - a fresh ‘ecumenical’ approach to the music where Pete manages to integrate the contemporary European sound – drawing upon Classical harmony and modal folk music - with the more traditional American approach. His work at the RAM has been responsible for the emergence of a whole new generation of improvisers with strong compositional personalities. In 2007 Pete received the 2007 Parliamentary Award for services to Jazz Education. Bmus/Post Grad Composition & Arranging, Ensemble Coaching & Repertoire. Post Grad Jazz – Harmony Classes, Ensemble coaching & Vocal Group, BA Drama - Chorus Master, Post Grad Leadership – Workshop skills. BA(Hons) Jazz – Harmony Classes, Stylistic Studies, Lecture/Seminar Series & Gospel Choir. BA Jazz – Harmony Classes, Ensemble coaching & Gospel Choir. BA Pop Music – Composition. Trinity College of Music, London. University of Queensland, Kodaly Programme, Brisbane. The Mediterranean Jazz Summer School, Roujan. 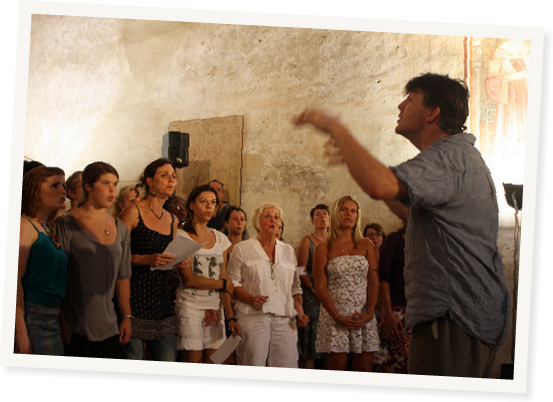 The Loire Vocal Jazz Summer School. 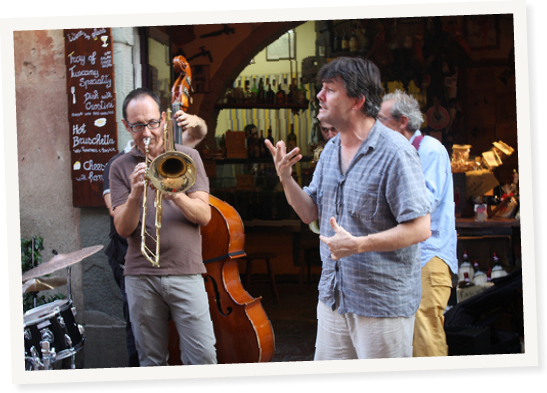 Global Music Foundation Jazz Summer School, Tuscany. North Queensland Jazz Summer School. Kuala Lumpur, Penang, Hong Kong and Singapore. Improvisation master classes with London Philharmonic Contemporary Ensemble (RENGA). Wavendon ‘All-Music’ Courses with Johnny Dankworth. Glamorgan University Jazz Summer School. Keynote Speaker at Bath Spa University and South West Peninsula. Various training courses, Inset days & related workshops for Wider Opportunities scheme and Sing-up campaign for Music Services throughout the country. Member of JCAB (Jazz – a Creative Approach to Business). Adjudicator/Mentor – Music for Youth. CPD Workshop leader for the National Youth Jazz Collective. CPD Workshop leader for the ABRSM. Commissioning editor, creative consultant, composer, arranger & performer for ABRSM jazz syllabus. Not content with hiding himself away in the halls of higher education, Pete spends much of his time working in Primary and Secondary Schools both as a Jazz Educator and also as Singing Workshop leader. He believes that through singing and movement children are able to develop good habits of rhythmic stability and eloquence – to connect with language and groove in a way that will centre them in later life. This belief has informed the considerable amount of writing he has done for children over the years.